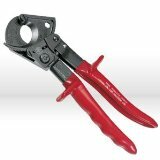 A high-quality cutter for copper and aluminum cable. It offers accurate and tidy cutting, the ratcheting operation negating the need for a long-handled tool for the tougher jobs. Multi-conductor cables may also be cut with this tool. As the ratchet may be released without cutting all the way through, it is also possible to use the cutter to neatly strip the insulation from wire. User reports indicate a high level of satisfaction with this tool despite its relatively high cost. Samples of comments submitted: "worth every penny", "these work amazingly well", "excellent performance ... highly recommended". Users also reiterate and highlight the manufacturer's warning that the tool is not designed to cut steel or other materials harder than aluminum or copper. When used as intended, it is a highly efficient and both time- and space-saving cutter.